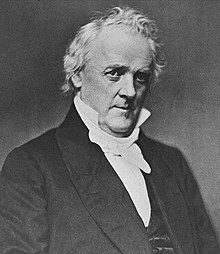 James Buchanan Jr. (/bjuːˈkænən/; April 23, 1791 – June 1, 1868) was the 15th president of the United States (1857–1861), serving immediately prior to the American Civil War. A member of the Democratic Party, he was the 17th United States secretary of state and had served in the Senate and House of Representatives before becoming president. This page uses material from the Wikipedia article "James Buchanan" (contributors), which is released under the Creative Commons Attribution-Share-Alike License 3.0.